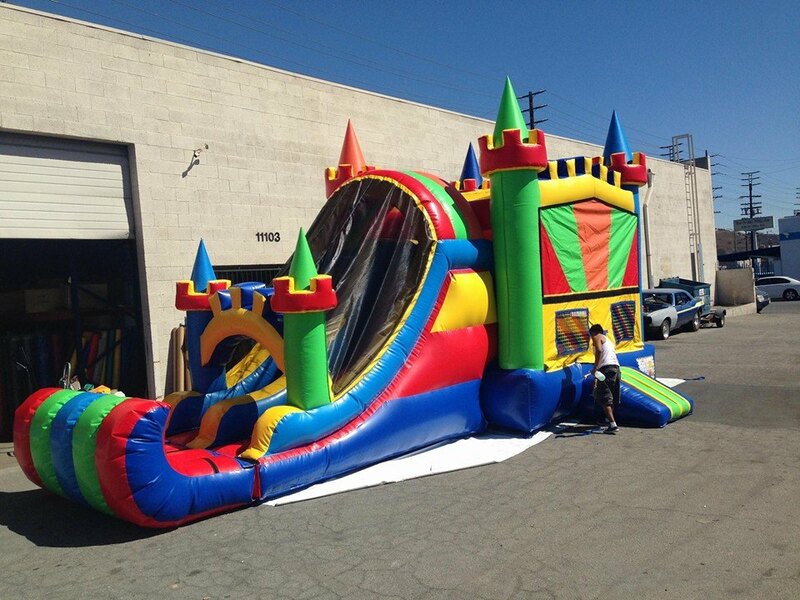 Introducing our Amazing 5n1 Combo Bounce House Rental! What is so amazing you ask? 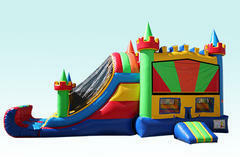 This combo bounce house rental includes 5 activities for your children and guest to enjoy. 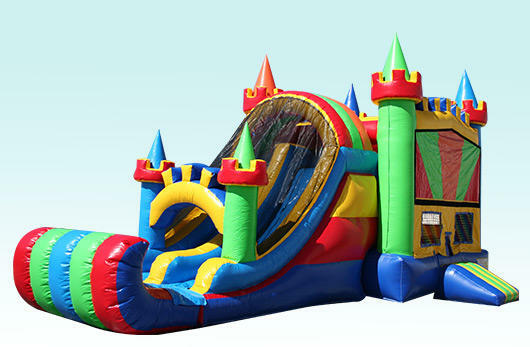 You enter through the front right of this combo bounce house through the inflatable ramp, which provides a measure of saftey while ensuring comfort for hands and knees. Once inside the colorful bounce house they will experience a large bounce area that include an inflatable basketball hoop. This hoop can provide hours of enetertainment, casually shoot hoops or have some freindly competition amongst friends. To the left of the bounce area there is two inflatables climbing ladders that lead to the top of a dual lane inflatables slide. There is a partition down the center so two people can race to the bottom of the slide. Once at the bottom they will have a soft safe landing because this unit features a large bumper that will stop the racers from going off the unit. They exit and run around the front of this bounce house to do it all over again. Be sure not to miss adding a banner to add a theme to this unit once you place it in the cart. Also make sure and add some flavor to your party by adding one of our concessions. Also make your party a splash with our Dunk Tank rental. 2 outlets within 75ft of set up area is needed, each oulet must be on a seperate breaker switch, we do provide ext cords but for fire safety we do not run over 75ft.